We are planning for Maths Week 2016. If you have any suggestions/ comments about how we can make it better or what you would like to see or engage with, please send us a note at mathsweek@wit.ie. We need your input. Follow us on Twitter - almost 3,000 do! Welcome to this July issue of Maths Week Ireland Newsletter. We don't have a lot of news this month, but from next month there will be lots of news and activities in the build up to Maths Week! Happy holidays to all of our teachers and students – we hope you are enjoying a well-deserved break..! We are currently reviewing our website www.mathsweek.ie and would love to hear your thoughts about what changes or new content you would like to see on there. Please drop us an email at mathsweek@wit.iewith your thoughts. 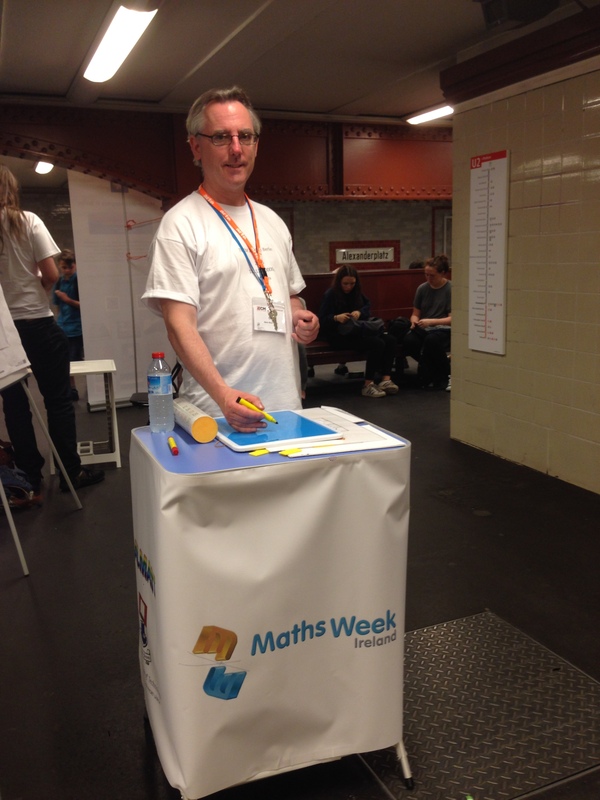 Members of the European Maths Society Raising Public Awareness committee, including Maths Week Ireland’s Eoin Gill, joined students from Freie Universität Berlin in bringing maths to commuters on Berlin’s U-Bahn during the 7th European Congress of Mathematics earlier this month. The pictures were taken in Alexanderplatz Underground Station. Congratulations to members of Ireland’s Maths Olympiad team who competed this month in Hong Kong. The team earned three Honourable Mentions and consisted of Robert Sparkes, Anna Mustata, Ioana Grigoras, , Cillian Doherty Liam Toebes, Antonia Huang. And well done to the leaders Bernd Kreussler and Anca Mustata and all others who participated and supported during the year. The annual Spraoi Festival will take place on the August bank holiday in Waterford city. Our team will be out entertaining the public with lots of fun maths activities. Be sure to say hello if you see any of our volunteers out and about! There is still time this summer to sign up and send your child to one of the great science or maths camps being run across the country. Have a look at the Schooldays.ie website where they have compiled a list of all known camps taking place. Good luck to Thérèse Dooley, Elizabeth Oldham, Maurice OReilly and Gerry Shiel who are coordinating the Irish National session at the International Congress for Mathematics Education tomorrow in Hamburg. An overview of recent developments in policy and practice in relation to mathematics education in Ireland will be presented. The international audience will be told how reviews of the school curricula for mathematics have been undertaken, and significant curricular reform at post-primary (secondary) level has been implemented (although not without controversy). Whilst these activities have been informed by international research and practice, research in mathematics education in Ireland has been driven by several initiatives, both by Government agencies and by research centres and conference series in higher education institutions. There are researchers in mathematics education in all of the Universities and in some of the Institutes of Technology. Moreover, other state agencies conduct or commission large-scale research projects. More broadly, the Teaching Council was set up in 2006 to regulate the teaching profession and promote professional standards, and can be expected to impact on teachers’ professional development. If you have not yet completed a summer course there are still lots running in August and from which you will receive yoru 3 EPV days. Have a look at which ones are running near you by clicking here. The MathsJam Annual Gathering 2016 will take place from November 12 – 13 at Yarnfield (between Birmingham and Manchester). This is run by Maths Week regular Colin Wright who is indefatigably enthusiastic about all things mathematical. The fun weekend is for people interested in puzzles and recreational maths. The Olympic Council of Ireland has set up a web page for the Irish athletes taking part in Rio 2016. The Olympics can form the basis for some great problem solving maths questions in September, for example, which country won the most gold medals in proportion to the amount of athletes they sent? Or look at the history of the Olympics – which country has won at least one gold medal in every summer Olympics? For more ideas visit about how to integrate the Olympics into your teaching visit the scoilnet website. Euclid, Pythagoras, Newton, Euler, Gauss and Boole, unsurprisingly, found themselves drawn together and, after long aeons in each other’s company, set up a maths club – the Dead Mathematicians Society. At the end of every meeting, though, the mathematicians liked to take turns setting each other brain twisters and puzzles – a nice, fun way to end a session. As they’d been meeting for so long, though, they eventually ran out of puzzles to set. One day, a child was walking past the group and saw them sitting around, looking miserable and not speaking. “Well, lads,” said the child. “I’ve got a puzzle for you. The mathematicians sat around for a while, gazing into the middle distance, trying to figure out the solution. First Newton got it, then Euler did. Gauss took a little longer, but he got there eventually, and so did Euclid. But, try as hard as he could, Boole just couldn’t figure out what his number was. Can you help him out? What is Boole’s number? I know there is a wonderful summer break ahead of us but I cannot believe that the great festival of maths is only three months away. It feels like yesterday that I flew back home from the last extraordinary event. This edition is light hearted but hopefully full of resources you and your pupils can use to entertain themselves during the holiday period and beyond. Have you ever looked at an image and thought it would be an ideal tool to introduce a topic in the maths lesson or enhance what has been taught in the past. Take a set of photographs of a greenhouse or conservatory. We can look at angles (measuring and estimating), areas of glass and costings, symmetry, volume (up to the top of the vertical walls if dealing with a younger age group). Ask the pupils to be creative and photograph numbers or interesting shapes they see. Get them to produce simple equations illustrated with items like teaspoons or rice, etc. There is a wonderful website, Maths Eyes (http://www.haveyougotmathseyes.com/) based in Dundalk, Ireland which will give you many ideas and material for this project. The past competition entries are innovative. If you or any of your pupils do take photographs which you think are worthy do wait for the website to open the 2016 competition and could you send me your and your pupils’ (with parents’ permission) to me atdouglas@dcbeagle.com. I will use them in my Maths Week presentations this year. Not everything that counts can be counted. Not everything that can be counted counts. Teaching should be such that what is offered is perceived as a valuable gift rather than a hard duty. A presentation of illusions giving the pupils the opportunity to draw and create their own. It is always frustrating creating worksheets when division signs are required and time is spent clicking Insert Symbol. There is an easier way: To make the division sigh Hold down ALT and then type 246. Adrian Bruce is a well-known Australian educationalist who promotes problem solving and lateral thinking in mathematics and his website is full of good ideas. 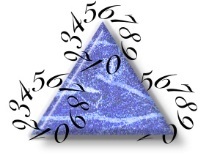 The compilation of maths activities is vast and covering all age groups. In the past I have got my young mathematicians to explore the games and puzzles on a particular website and their written review must be a synopsis of the activity and the ratings judge difficulty and enjoyment. This saves many hours playing the games yourself. Q: What happened to the plant in math class? A: It grew square roots. Teacher: Why are you doing your multiplication on the floor? Student: You told me not to use tables. Q: How do you make seven an even number? Q: Why should the number 288 never be mentioned? A: It is two gross. The apprentice: "But that makes four thirds already!" "Well - just take a larger pot!" Brain Bashers http://www.brainbashers.com/logicpuzzles.asp. A mine field of puzzles and activities. Wishing you a happy, peaceful and fun summer. I am looking forward to meeting some of you in October. Copyright © 2016 CALMAST, All rights reserved.